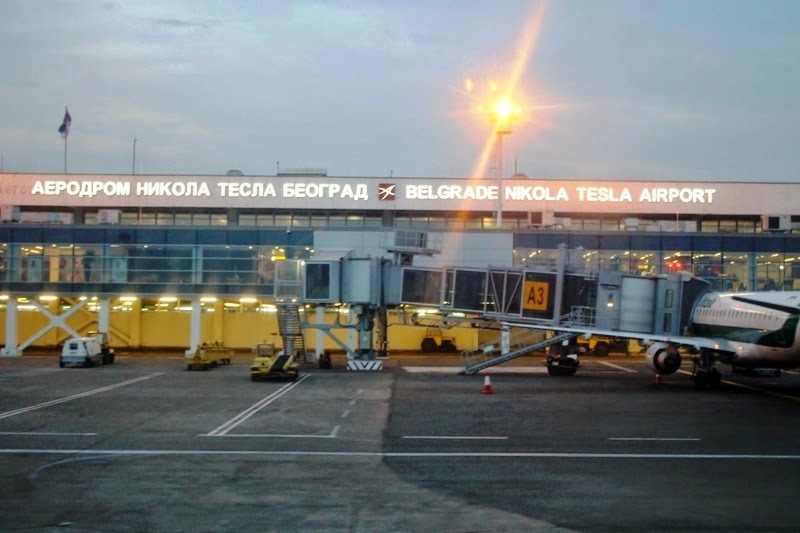 The Serbian government has announced it will decide on how Belgrade Nikola Tesla Airport will be expanded by June 2015 as capacity becomes stretched. The Minister for Transport and Communication, Zorana Mihajlović, said, “During next year we will definitely decide how we are going to expand Belgrade Airport, because it will be unable to handle all passengers if this growth rate continues. We could never have anticipated such large growth”. According to current plans, the airport will refurbish the remaining gates and departure lounges before adding an additional floor on top of its Terminal 2 building. Ms. Mihajlović says the recent Memorandum of Understanding signed between Belgrade Airport and the French concession and construction company Vinci, is non-binding. However, she adds, it foresees the development of joint projects and business decisions which could help Belgrade become a regional hub. Last week, the country’s Prime Minister, Aleksandar Vučić, ruled out any plans to sell the airport, noting that the government was currently considering whether to offer a concession or invest in the airport on its own. In the first three quarters of this year, Belgrade Airport handled 3.590.231 passengers. It welcomed its four-millionth traveller on November 4. During the first nine months, Air Serbia was the dominant carrier at the airport, handling 50.3% of all passengers, up from 39.7% over the same period last year. According to the airport, Air Serbia's busiest destination was Paris with 120.685 passengers, followed by Zurich, Moscow, Podgorica, Tivat and Athens, which saw its numbers jump from 24.498 passengers last year to 84.759 travellers in 2014. The second busiest airline operating in and out of Serbia’s capital was Wizz Air, followed by Lufthansa, Montenegro Airlines and Swiss International Air Lines. Belgrade Airport’s net profit has soared to 10.5 million euro in the first nine months of 2014, from 2.9 million euros a year earlier. Operating revenue was up 25.5% to 51.6 million euros through September while operating costs increased 2.3% to 29.3 million euros, data from the airport’s unaudited financial report shows. Cargo traffic was up 24% on 2013, totalling 8.447 tonnes in the first nine months. The total debt plus penalty interest Air Serbia has towards Belgrade Airport rose to 48.2 million euros by the end of September, from 35.7 million euros at the end of 2013. It accounts for 92.1% of the airport's total outstanding domestic claims. Since the topic is Serbia, here is a little shop I did. It looks great, but the engines pattern looks weird. INN-NS, I can try to do a A321, but I am busy with flying for the next few days so you might have to wait for a bit. I would also love to see Ejets in JU colors, there are so many thin routes they could fly them on! Just flew with it on LOT, a horrible aircraft, not near the customer experience you have on the Airbus and unsuitable for any flights of more than 1h30 + it can't take almost any cargo making it not that-cheap-to-operate as it may seem. Yeah because every route has cargo. Embraer E2-Jet family is set for 2018. Would be interesting if JU acquired some E2 jets to replace ATR aircraft on regional routes. This would also coincide with the A320NEO arrival. The last two sentences of that article are worrying. I think that's not an E190 but an E175. As Air Serbia's network grows they need to start considering the introduction of larger aircraft, either A320s or A321s. Early bookings for destinations such as Abu Dhabi or Athens are fantastic. Even Zagreb is selling really nicely, around 45% loadfactor for the first several flights. Well, Aegean is sending its A319/320 to Belgrade now so they can shift some of the passengers onto them. Ne mora da prsti...Sta je tvoj problem? Pa ne prsti ali je profitabilan. Sta bi ti, milijarde? Fora je u tome da su i jedni i drugi u velikoj zagubi. Daj mi dokaz da BEG nije profitabilan i u zabludi sam. Maybe it could look like this with new runway, terminal 3 and cargo terminal? Come on government, can't you speed up things a bit. USA flights in 2015 with this infrastructure will be painfull. It's so weird that Air Serbia isn't paying BEG for services, since they are doing awesome job and being profitable. Can't decide if post is ironic or not. Either way - big win. "We could never have anticipated such large growth"
Well I could, as soon as Air Serbia deal was announced and 10 Airbus planes were mentioned back in August 2013. It was perfectly clear this GoS/Etihad backed deal was a serious venture and available seat capacity increase was massive compared to JAT's fleet shortage in early 2013. She could have just asked Danny what his growth plans were. Even outsiders like myself were clear back then it would be at least 30-40% YoY more than JAT in the worst case scenario. This blog had news from back in 2013 on failed GoS attempts to find the investor for the airport, so they were looking to expand back then. If they had succeeded in closing the deal back then, new BEG terminal would have been almost done by June or late 2015! Now they will only make a decision by June 2015, and we can only imagine when will new terminal be operational at the earliest - late 2018 or early 2019 perhaps? Pushing back is not in Air Serbia's interest, as A320NEO's will be arriving at that time. I mentioned months ago that Air Serbia mgmt executed their tasks in impressive way and the real bottleneck for growth would be failure of GoS to resolve Airport issues. As the time goes by, I am even more concerned about BEG becoming limiting factor for Air Serbia. It would make business sense for Hogan's team to help protect EY investment in Air Serbia by helping Mali/Vucic team in their quest to find at least partial EU-based investor/operator for BEG. Well, are government is obviously pretty..hm..disorganized. They wanted to make AirSerbia as an lider in this part of Europe, but they forgot about expanding airport. Wow, now that is an smart move! Now they will add some small, unnecessary things to T2 and we won't see nothing more before..2018-19?? Airports in Athens, Bucharest, Budapest, and even Zagreb will be much bigger than BEG by then. And what about flights to USA? They will make all even worse. The situation isn't as bad as it seems. In the present state, with some minor improvements, BEG could handle 8 million passengers what gives the government at least a year or two to decide on what to be done. I would like to remind you that until very recently Doha had an airport not much bigger than Belgrade while handling 20 million pax with a single runway. The solution that was applied there could be applied in Belgrade as well: constructing more apron space alike to the C7-C10 and bus gates. Those could be set up in a similar way as in Budapest (go out from an air bridge and find your bus-gate on the apron), albeit a bit more fancy. The later can be applied in a matter of months while in 6 months to a year new apron space could be constructed though i think Belgrade will survive this year even without it but the planning has to start now. Those should ideally be located in the space between the taxiway and the 'tehnika' apron (that it should be merged with), with an extension of the taxiway (yellow dots) going towards it. http://cs14101.vk.me/c618129/v618129496/221ea/61O2kcCevzk.jpg As for the terminal capacity, Belgrade is far bellow the average congestion levels that you could see in Budapest or Istanbul. Nothing dramatic in there. I am in a hurry so i'll share more comments later. Of course the situation can get much worse but why should we risk it? Why force your passengers to experience horrible transfers if we can avoid it. It's better to think ahead and make long-term plans. That would be cute and cheap solution for Belgrade, don't you think? I'll not bother answering your questions. Additional apron space is needed anyway and that space is wasted currently. It'd also allow for shorter taxing times from/to the runway. In the meantime a new terminal can be built without too much constraints on the old one. What worries me more is actually the cargo capacity besides the already mentioned luggage-handling problem. Also, a railway link must be a part of the new airport terminal. With an electrified railway-line passing only a few kilometers from the airport, it would be a stupidity of incommensurable proportions not to construct a link to if from the airport: http://www.bueker.net/trainspotting/map.php?file=maps/beograd/beograd.gif from where would run a Beovoz line Belgrade Airport - Resnik and Belgrade Airport - Pancevo or at least Pancevacki Most. - To top all that, the tickets cost 0.25 Euro cents and they're managed through an electronic card like in Dubai that gives you 1h30 free transfers on any metro or bus line. Compare that to what you're charged in Belgrade. Obviously, Georgia isn't a rich (even less oil-rich) country and the budget of Tbilisi is probably several times lower than the one of Belgrade with similar energy prices, but the lack of corruption coupled with long-term planning can do wonders. Good report, thank you. Now pick up the phone and call TAV. Tell them you did a great job praising their TBS investment and ask them why wouldn't they invest few hundred million in BEG? lol molim te , you are comparing Tbilisi with Belgrade and Zagreb??? lol ! Probably this Soviet guy never went out of Rustaveli street in Tbilisi. Tbilisi excepet of the small area of city centre looks like African countryside. There are no asfalt out of the city centre! Chickens are sold on the street! People are having pigs in the yards in Avlabari area near the Chatedral. OT: I want to visit some of airplane museums in Europe (excluding UK and CIS) next summer. I have seen a few including Belgrade and Bourget. Looking for hidden gems. Any suggestions or experiences to share? Thanks! And here we go: Air Serbia has accumulated 13 million of Euros of unpaid fees in the 9 months of 2014 on top of old debts from JAT and Air Serbia. At the same time it leaked in the newspapers that NIS profits dropped by 33%....ring a bell? It is a political will to MAKE Air Serbia profitable. The bill is paid by Aerodrom Berograd and NIS and because (being state and partly state owned) by the tax payers. As I predicted, the real loss of ASL is higher then the loss of old JAT and the only profitmaker is Mr. Hogans Etihad. Well, even if that is true, you can't just buy some unprofitable company with many debts, and expect 'resurrection' for one year. Of course they all say that AirSerbia is profitable, come on, that is policy. We all know that AirSerbia is not that great as it is shown, but wait 3-4 years more, they will be much better and stable company. You can't just expect total recovery in this short period. We all know that almost all politicians and directors are lying so they could be heroes, you did not discovered nothing new. U ugovoru piše da će se svi popusti računati kao ulaganje Vlade Srbije u Air Serbia. Svi ste to čitali valjda. Air Serbia ni sledeće godine neće sve plaćati BEG-u (kao što i piše u ugovoru koji smo čitali), ali verujem da će i sledeće godine biti likova na ovom blogu koji će i dalje pokušavati da otkriju toplu vodu sa tim podacima. And here we go: old debts of Jat and Air Serbia have been written off and the address where they should be claimed is now Nemanjina St. in Belgrade (government headquarters). The fall in NIS' profit was not 'leaked to the newspapers' but was publicly announced by NIS and documented in their Q3 report - the very same report that says that even though the sales of fuel in Serbia are on decline, revenues did not suffer that much thanks to increased demand from Air Serbia. They never mentioned how much exactly Air Serbia owes to them and how much is the old Jat debt. At the same time the airport will welcome one million new passengers in 2014 exclusively thanks to Air Serbia. Its revenues have grown more than 30% and the shares are at historical high. So would you kindly elaborate that 'bill' the airport and NIS you say will pay? I noticed that Air Serbia moved its afternoon Zurich flight from 18.25 to 18.05. I know that for the O&D passengers it does not mean much for transit it's quite a lot especially since they can connect to Abu Dhabi now. It's also good if they have the A320 rotating somewhere. There were many problems before if the aircraft would land 20 minutes late. "SAD, Egipta, Tajlanda, Singapura, Južne Koreje, Jordana, Saudijske Arabije, Bahreina, Omana, Sejšela, Maroka, Novog Zelanda, Pakistana i Vijetnama"
Quote from DCV PR: " S obzirom na to da je Er Srbija izrazila želju da leti ka ovim destinacijama, delegacija Srbije će sa 14 zemalja usaglasiti i parafirati sporazume o vazdušnom saobraćaju"
OMG I can see USA, Egypt, Jordan and maybe winter charters to Seychelles and Phuket, but other places like Oman, Pakistan and even New Zealand?!? Is it possible EY wants JU metal to do more milk runs for them? Did you read it? It says right here: S obzirom na to da je Er Srbija izrazila želju da leti ka ovim destinacijama. Mesecni leasing za 772LR je 0.800 do 1.200 mil $ . Ja mislim da tu routu za AKL hoce EY da leti ASL zato sto oni ne lete tamo pa bi mozda to ovako izledalo BEG-AUH-AKL-AUH-BEG to bi bio pun pogodak i za jedne i druge . When they say flights i guess they also mean codeshares. Pitam se da li ce se smejati kad pocnu ti letovi? I would add USA to your Amman and Cairo for Air Serbia list of future destinations, agree that others are codeshare. However LOT is sometimes using their birds in winter season for tourist charters to faraway destinations listed here like Thailand and Seychelles but I hope Air Serbia is not going to follow that model. It looks like DCV's PR made an error in declaring all those countries as being on Air Serbia wish list of destinations instead of clarifying most of them as being codeshare. Now that we clarified this misunderstanding, we can start guessing Etihad partners for those destinations. For example Morocco could be codeshare with Alitalia (Casablanca and/or Tangier) etc. i would fly with them to AMM ! (for years i can hardly find anything under 400€ from west europe to AMM). u can see that even foreign carriers had 9% more passengers than in 2013 until September 2014. That is even greater growth than most of the airports in ex yu which is really interesting that even without Air Serbia’s growth, BEG would still be one of the fastest growing airports in ex yu. Of course. Overall 33% is nothing compared to amazing 9% brought by foreign carriers, therefore we do not need Air Serbia at all. BEG will become the miracle of Europe by funelling passengers to Star Alliance hubs and sending O&D to Wizz. That is the magic formula, everything else is a dark conspiracy of James Hogan paid by Serbian taxpayer. With this grow, BEG will be too tight in next few years. Maybe 2015 they will survive somehow, but what about later? Air Serbia intends to launch flights to New York, Toronto, Chicago, Beijing, Bangkok, Singapore... And now you tell me that flights to all those destinations, which possibly will be performed daily, will be performed while the airport is in this condition?! Wut? Ok, they will add an addition floor to T2, but what then? From an airport with such an airline and all those destinations, you can expect it to have a capacity of at least 15 000 000 px/year. How can BEG, which by 2018 will be even smaller than Zagreb, have those flights? I mean I am living in Belgrade, between 12:00AM-14:00AM hearing airplanes every 5 minutes, and I know that BEG is one of most important hubs in the Balkans, but how can they expect from Air Serbia to be an 'world known airline' which is 'the most important in the Southeast Europe' with an airport of such a small capacities? I mean so much baggage was lost this year, so much delays on the airport, it's just obvious that BEG still can't take so much flights and passenger grow. The new runway is not so important as it is the new terminal. But I think I know why management is waiting so long- maybe they want to see how much can Air Serbia expand on the basis of transit passengers in this year, so they could make some big project with adding an addition terminal to Air Serbia which may'll have a capacity of 10 000 000 px/year in 2015? If they are not planning nothing to do with airport, but they are planning flights to the US and Canada, I don't have nothing more to say about their organization. Oh boo-hoo... I have no sympathies for airports in general. So many airports around the globe are ripping airlines off and are usually the last ones to give up on a share of their income for the sake of an airline surviving. Anyway, Belgrade's revenue is up so that's all that matter. oko 15.000.000 miliona putnika I zadovoljio bi potrebe za iducih tridesetak godina. Nepotrebno je reci da to ne moze finanansirati aerodrom Beograd. Naravno ima ko moze i hoce. Srbija valjda hoce razvoj. Oni koji osporavaju, niti imaju novac da sami rade niti zele da dozvole drugom da radi...Tipican "sindrom revolucije 45". Takvi ljudi ovo ce nazvati megalomanija. Njihovo vidjenje je"mimhi-manija"... U BOGA se nasam i u sposobne ljude da ce preporod Aerodroma Nikola Tesla Beograd biti potpun i prilagodjen. Imam mogucnosti i posecivacu godisnje gradnju novog drugog aerodroma u Badgerys Creek-u zapadnom predgradju Sydney-a, prirodno i gradnju projekta u mojem Otacestvu i gradu Beogradu. Ko ce biti efektniji u ostvarenju, o tome drugi put. Radovan & zaljubljenici u putnicku avijaciju i svemu sto joj u dobru sluzi. Kraljevo /// Sydney. ANT poseduje zemlju ulaganje nije preveliko kao u Atlanti. I Zagreb kad se sagradi mostove imace pola kapaciteta sadasnjeg ANTa. kako kazete da je drzava "spucala" 600 miliona evra za mostove... "pucalo" se mnogo na razne nacine po Otadzbini Srbiji... I "ispucalo". Ostalo se "tuzan sirak"... Mostovi su neizostavni, jer kako stici do aerodroma bez mostova. Sava siroka. Dunav presirok... Ne postoji ni jedna banka, nijedna institucija koje mogu finanansirati Beogradski aerodrom. Prirodno, mislim da se izgrade svi objekti u iducih pet godina. Bez improvizacije, Bez gradnje u nastavcima koje se protezu par decenija... Razvoju Er Srbije, prerastanju aerodroma u aerodromski centar za putnicki, kargo saobracaj i pratece delatnosti za ovaj deo Evrope. Smanjite dozivljaj pola od pomentog su objekti koje treba da prave zainteresovane kompanije ako ih ima. Hotel na aerodromu? Koje garaze? Ima samo jedna. Pristup bez problema. Postojeci parking je polupopunjen i u vreme dana kada leti Air Serbia. Novi terminal je neophodan, ili jedno dobro prosirenje postojaceg. Ne moze AirSerbia da ima letove za SAD, Tajland, Singapur, i Australiju ako BEG ima bedan kapacitet od 5000000putnika godisnje. Sa sesnaest airbridgeva ima vise nego dovoljne kapacitete za po jedan let dnevno na te destinacije. Sadasnji kapacitet je dosta iznad 5 Meleona putnika. Ma ajde molim te a gde to pise? ima jos bar pet godina vremena za rast broja putnika za BEG do 8 miliona. Treba vise radnika na sortiranju prtljaga. Venecijanski aerodrom ima jos 30-tak gejtova koji nisu direktno spojeni sa terminalom, BEG ima cetiri, C7-C10, a gejtove na B platformi ne racunam jer se vise koriste za cargo saobracaj nego za putnicki, ali eto uracunaj B1-B7 i ima 11 takvih gejtova, ukupno 27. Venecijanski aerodrom ima oko 37 gejtova, sto automatski povecava kapacitet. Razumes?